1. Try not to overload your stamp with ink as this can make the image quality poor. To do this always put your stamp on a flat surface and take your ink to the stamp patting lightly onto the stamp a few times, rather than pushing your stamp into the ink which can overcoat the stamp. 2. Know your ink types, Pigment inks take longer to dry and are best when embossing, where as a Dye based ink will dry quicker and give a crisper outline, great for colouring in. Don’t forget to store your ink pads upside down so the ink is at the top of the pad. 4. 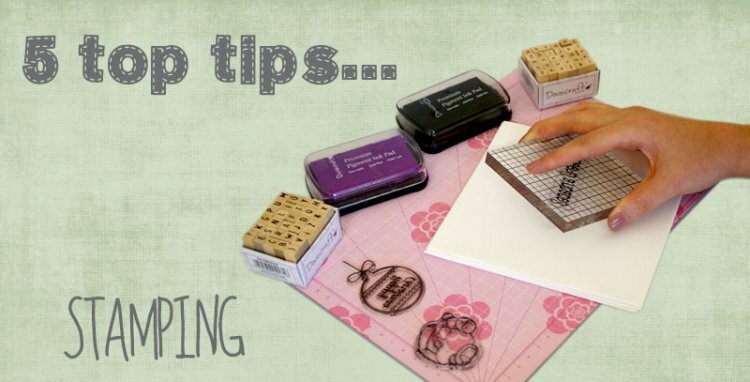 When using a rubber stamp for the first time, lay sticky tape on the rubber and remove. Repeat this several times to remove any residue left from when the stamp is first created which could affect stamping for the first time. 5. When creating your own decorated patterned paper with stamped images, put a scrap piece of paper under your stamping project and stamp part of the image(s) to show where the pattern would have continued.